From a flaming White House helicopter and Hurricane Charley-spawned tornadoes to Howard Hughes and Elvis, Bob Showalter has just about seen it all at Orlando Executive Airport. Showalter's father, Howard, and two cousins took over operations at Orlando Executive Airport in 1947, and Bob was born a few months later. It seems he has been hanging around the landing strip and environs just north and east of downtown ever since. "It's been a really good ride. I wouldn't trade places with anyone," said Bob Showalter, who recently agreed to sell the family business for an undisclosed price to Atlantic Aviation of Plano, Texas. The transaction should be complete in January. That means Showalter, 67, no longer will run Showalter Flying Services with his wife of 43 years, Kim. They've overseen the fueling of planes and providing rental cars and concierge service to pilots and their passengers for the past 41 years. And it is the people who have come through their doors that have provided some of Showalter's most unusual and treasured memories. Like the time Howard Hughes landed at executive airport in his turboprop Conair plane around 1960. "Need to make some phone calls," announced Hughes, who was wearing a fedora and overcoat even though the weather was balmy. Hughes closed himself off in Howard Showalter's office for hours, then left without saying a word to anyone else. On the desk, Showalter said, were three $100 bills to cover the numerous long-distance calls Hughes made. "He [Howard Showalter] clearly made a profit," Showalter said. Showalter's father also noticed another distinguished visitor in the early to mid-1960s when a fellow with a thin mustache and a traveling companion flew in and rented a car. He produced a paper California drivers license that said Walter Smith. In reality, it was Walt Disney, who was with his brother Roy. They were in town scouting out land where they would build Walt Disney World. "We watched Disney every Sunday night. There was no wondering who he was," Bob Showalter said. Howard Showalter, Bob recalled, hopped in his car and followed the Disneys a couple of hours as they drove around before losing them in Kissimmee. Sadly, Howard Showalter died in 1965 saving a drowning boy in the surf off New Smyrna Beach. He was posthumously awarded the Carnegie Hero Fund Commission's bronze medal. Showalter Field in Winter Park — where the family operated a landing strip before going to Orlando Executive — is named in his honor. Bob Showalter started working at the executive airport when he was youngster, sweeping out hangars. He moved into management in 1973. He remembers taking care of another famous customer a couple of years later: Elvis Presley, who called the airport first. Showalter thought someone was pulling a prank at first, then realized it was Presley, saying, "I recognized his voice." Presley flew in on a Learjet and showed up at Showalter's office in sunglasses and a baseball cap. "He was puffy and pasty and kind of sweaty," Showalter said. "He just looked tired." Showalter rented Presley a yellow Chevrolet Impala and did not see him for a few weeks. When Presley returned, he said, he had lost weight and was tan. "He looked far more fit and healthy," said Showalter, who suspects Presley went to some sort of rehabilitation center. Perhaps the most tumultuous times at the airport came in 1996 and 2004, when a helicopter assigned to the White House burned up after a rotor collided with a light pole, and tornadoes on the leading edge of Hurricane Charley damaged or destroyed 50 airplanes and 10 buildings, respectively. When the helicopter, which was part of a support team in town for a visit from then-President Bill Clinton, clipped the pole, Showalter said debris shot all over the airport and tore holes in the tails of several planes. Fortunately, no one was hurt. Charley cost an estimated $3 million in damages, not including customer-owned airplanes. The Showalters rebuilt, he said, but it is difficult for a small company such as his to compete with large chains, making this a good time to say goodbye. 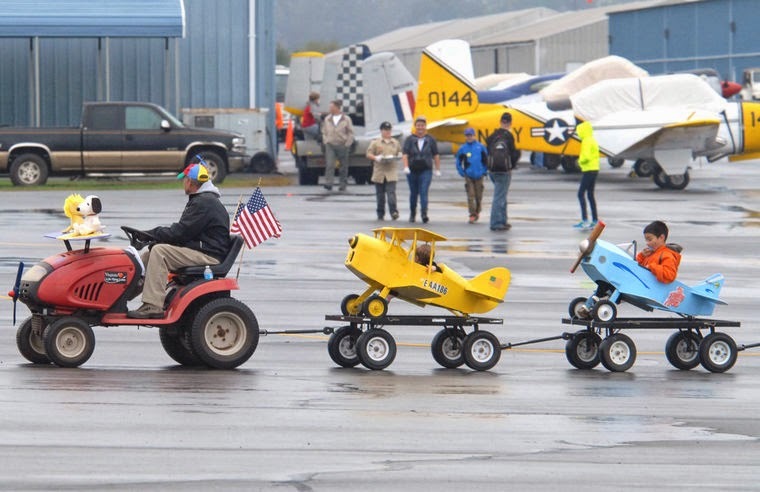 But he intends to continue hanging around the field by selling airplanes with his son, Sandy. "We'll be off in the corner," he said. On a dark, misty morning in January 2012, Southwest Airlines ramp agent Jared Dodson steered his baggage tug, with four empty carts behind him, out of the main terminal at Dulles International Airport and headed toward Concourse B. He came to a complete stop as he reached Taxiway B, then continued straight across the airplanes’ runway. As Dodson crossed the runway, a 35-ton mobile lounge with a handful of passengers aboard, driven toward Concourse D by Kenneth L. Smith Jr., made a diagonal beeline toward him on the runway at about twice Dodson’s speed, investigative records show. Smith later said he never saw Dodson’s tug below him, and he smashed into two of Dodson’s empty carts. The impact hurled Dodson under the wheels of the mobile lounge, crushing him. Dodson remained conscious for a time, as horrified coworkers rushed to his side, but he died the next day. He was 25. Dodson’s parents, J.C. and Nancy Dodson of Paeonian Springs in Loudoun County, worked with Southwest and the Metropolitan Washington Airports Authority, waiting to hear the details of what had happened to their son — and why. But as the months passed,they learned nothing. The driver, Smith, was not given a traffic ticket, so no information was going to emerge from a criminal case. In April 2013, the Dodsons sued MWAA. As their legal team investigated the squadron of 50-year-old mobile lounges at Dulles, they found what their experts thought were serious safety flaws, as well as confusion over the rules about the Dulles runways and the lack of a risk management system at the airport — all of which they thought contributed to the accident. MWAA responded that the lounges were safe and safety was paramount, and that Dodson simply had driven into the lounge’s path and failed to wear his seat belt before his baggage carts were run over. On the eve of trial last month, MWAA paid a $2 million wrongful-death settlement to the Dodsons. The family still believes the lounges are unsafe, and recently spoke for the first time about the problems they and their experts found. Officials at Dulles disagree, and say the lounges have had an extremely small number of accidents over the last 10 years during millions of runs between the main terminal, Concourse D and other international arrivals. MWAA said the decision to pay the Dodsons $2 million was made by its insurance company and is not an admission that Smith or Dulles was at fault. Among the problems the Dodsons and their lawyer, John D. McGavin, found were that the windshield wipers on the sides of the small box-shaped cabins of the lounge drivers were removed years ago, and lights on the speedometers have been turned off due to glare; that vehicle drivers at Dulles are unclear about speed limits and rights-of-way, and that visibility of vehicles at Dulles in the dark is sometimes difficult. The Dodsons’ investigation found that no lounge driver has been given a traffic ticket while driving at Dulles, and that the MWAA police are unclear on the rules governing vehicles around the terminal. The MWAA police investigation said that “human error” caused the fatal crash and Smith was to blame because he failed to notice Dodson and drove into his path. Christopher U. Browne, the airport manager at Dulles, said the police findings were preliminary and based on incorrect standards. He said the lounges “always have the right of way, regardless of circumstances, except with aircraft or emergency vehicles with lights flashing . . . Other vehicles must provide adequate distance when operating around mobile lounges.” He added that in the last 10 years involving more than 4.5 million trips by the lounges, Dodson was the only fatality. Smith did not return messages seeking comment. Records show he told MWAA police immediately after the accident that he saw Dodson’s tug initially, but didn’t see him once both vehicles were on the runway. But in his lawsuit deposition, Smith said he never saw Dodson at any point. James A. Higgins, a professor of aerospace science at the University of North Dakota, analyzed the accident for the Dodsons and said it was indicative of a lack of safety enforcement at Dulles. But Higgins said a larger problem was that Dulles does not have a safety management system in place to analyze risk at the airport and reduce it before an accident occurs. He said airlines installed such risk analysis systems years ago and have greatly reduced accidents, but the FAA has not yet required airports to do the same thing. “MWAA needs to realize that Jared Dodson, someone they were charged to protect, lost his life in a very preventable accident.” Higgins wrote in an analysis of the accident. Browne said that windshield wipers had been removed from the side windows of the lounge drivers’ cabin many years ago, but that no accidents had been attributed to their removal. He said that after the Dodson accident, strobe lights were placed on the side of the mobile lounges to make them more visible, and the crossing where Dodson was killed no longer is used by mobile lounges. As the trial approached in November, MWAA’s lawyers hired their own experts and argued that Dodson’s “contributory negligence” — that he failed to yield the right of way and was not wearing his seat belt — caused the accident. But in October, MWAA elected not to put the case in front of a Loudoun jury and settled with the Dodsons, court records show. MWAA spokesman Christopher Paolino said settling lawsuits involves weighing the costs of trial and the risk of an unfavorable outcome, and “it was largely the Airports Authority’s insurance carrier that did this weighing, and it reached the business decision to settle,” with no fault assigned to either side. 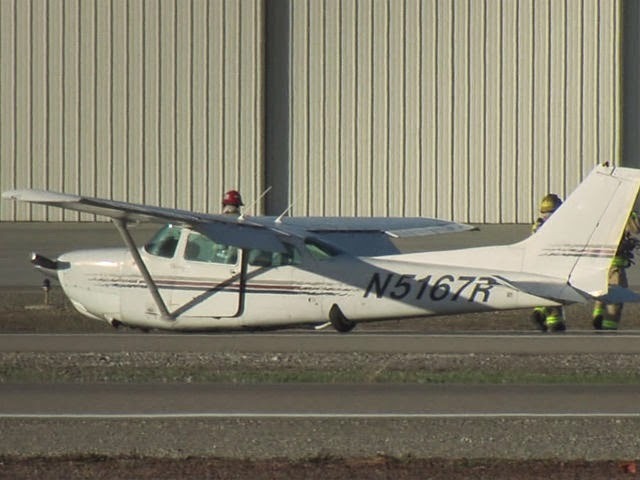 SAN DIEGO - On Sunday, a Cessna 172RG plane experienced landing gear problems at Gillespie Field, but was able to land safely on the runway without its landing gear. There were two people on board the plane, and both walked out the plane safely. The plane had been circling the airport hoping the landing gear would drop. More details and updates coming as they become available. 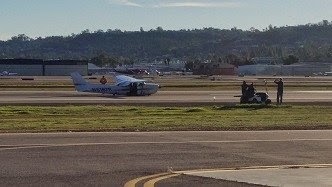 EL CAJON, Calif. - A small plane that was experiencing problems with its landing gear safely landed at Gillespie Field in El Cajon. The plane landed at about 3:40 p.m. Sunday after circling around the airport for more than an hour. It is unclear how many people were on board. No injuries were immediately reported. Efforts to restore what's conspicuously absent in the airline industry — consistently reliable service — are getting a boost from the work of University of Michigan researchers who are looking closely at 73 million flights during the past decade. It's no small task, but the key to running a smoother airline operation with fewer delays and cancellations during bad weather is buried in voluminous amounts of historical flight data, in fact more data than the airlines have the time and capacity to analyze, the researchers say. Behind the scenes, it takes thousands of people to help operate a major airline, and it's a safe bet that many of those who are on duty at this very moment probably have their hands full trying to prevent small problems from boiling over at major hub airports and cascading across the country at several hundred smaller airports. It is the nature of the business, an aspect that is virtually invisible to the traveling public. Snap decisions must be made on issues running the gamut, from cancellations to catering, to selecting which plane among a queue of aircraft that landed within minutes of each other will be assigned to the next available gate at the terminal. Often, the solutions are imperfect, based on the calculus of ruining the day for the fewest number of passengers scheduled to connect to other flights during the next hour when a bank of 50 planes will taxi to departure runways. Surely there is no time, and no apparent benefit from the standpoint of airline flight dispatchers, ramp managers and an assortment of other key personnel toworry about next week or fret about what could have gone more smoothly last week. But the tendency toward tunnel vision instead of prioritizing the larger picture might also point to precisely whythe commercial aviation industry sometimes appears to passengers to be caught flat-footed, particularly when bad weather suddenly flares in any or many of the time zones in which the air service operates. The Michigan researchers are crunching publicly available data from 2003 through 2013, covering all of the 73.8 million scheduled commercial flights in the U.S. as well as about 47 million hour-by-hour weather reports spanning each 24-hour period over the 11 years, said Brian Lemay, a doctoral student who is leading the project. The flight data being scrutinized is routinely collected and stored by the U.S. Department of Transportation, and the weather information is reported by the National Oceanic and Atmospheric Administration. The research project is using advanced data analytics, drilling down to details as small as taxi time and wind direction to identify patterns that the airlines perhaps haven't detected, the Michigan professors and graduate students said. "We have the time and the luxury and the resources to look at this one and two and three levels deeper'' than the airlines, said Amy Cohn, an associate professor in industrial and operations engineering at Michigan who researches airline industry operations. The research team doesn't expect to come up with "the one key piece of information that somehow no one at the airlines ever saw and that is going to radicalize the industry," Cohn said. "I think it is more a function of having, frankly, a bunch of really smart kids who are digging into the data." "The benefit of the work we are doing is going to be in the nuance, to help the airlines make some decisions in a more customized way,'' she said. "We expect the findings will lead us to suggest that at this time of day, in this part of the country, at this time of year, under these conditions, this is what you need to better allocate resources and have reliability." Cohn said data collected during the project may be used to build computer-modeling software that could predict the outcome of an infinite number of hypothetical flight and weather scenarios, helping airlines spot likely weather delays in advance and to adjust their schedules and staffing levels to minimize disruptions. Initial information is expected to be available over the next three to six months. It will be published in academic journals and also shared with the airlines and the Federal Aviation Administration, the research team said. The No. 1 goal is to shine a light that enables airlines to predict and mitigate weather-related flight delays before they spiral from airport to airport, she said. "What we are trying to do is to give a better sense of saying if it is storming in Chicago at 4 p.m., what do we think will be happening in Detroit at 5, 6 or 7 p.m.?'' Cohn said. "And where else should you be looking — in California at noon, in Dallas at 11 a.m. — to obtain the best predictive value?" "We are trying to better understand what these patterns look like and the relationships between airline operations, tactical decision-making and weather, and how delays beget other delays (at airports) downstream," Cohn said. She acknowledged the airlines have improved their capabilities in the last few years, particularly during winter, when approaching snowstorms can be forecast days in advance. Summer, with pop-up thunderstorms, presents a different challenge. "But if you have a better feel for where the downstream effect is going to be four and six hours from now, then you might be able to bring in extra resources like reserve crews,'' she said. "Six hours is enough time to begin re-accommodating connecting passengers onto other flights, through Dallas, for example, because Chicago is in jeopardy due to storms." Officials at United Airlines and American Airlines, both of which operate hubs at O'Hare International Airport, said to some extent they already carry out similar analysis internally to make their operations more efficient. But they said more information is welcome. "We have professionals in our integrated operations center — operations people and meteorologists — who analyze the weather, study historical data and work together to make the best decisions for our customers,'' American spokeswoman Leslie Scott said. "We are proactive about that analysis and making those decisions when we can be — for example, before the Thanksgiving week storm in the northeast and the projected Christmas Eve storm here in Chicago. In both of those instances we proactively canceled flights and issued flexible travel policies. "That said, we're always looking at new ways to improve our operation and better serve our customers," Scott said. United officials said improved technology has helped airlines to become more proactive in responding earlier to bad weather and "any additional information can be helpful with that process." The FAA did not answer questions submitted by the Tribune. The Guyana Civil Aviation Authority (GCAA) today said that a search operation for an Air Services Limited plane that went missing on December 28 over Region Eight jungle has ended without any sighting of the craft. Despite an intensive twenty one days of aerial and ground searches in mountainous and densely forested terrain in Region Eight for the ASL Britten Norman Islander, the aircraft and its occupants have still not been found. 8R-GHE disappeared on a routine shuttle operation Mahdia to Karisparu on 28th December 2014 with Captain Nicky Yakesh Persaud, 27 and cargo handler David Bisnauth, 51. After the aircraft was reported overdue, five aircraft conducted reconnaissance over the Mahdia, Kaietuer, Karisparu and Taffy areas following the most probable track that the aircraft would have flown. Three helicopters were deployed followed by an ASL Cessna Caravan and eleven (11) GDF Special Forces Officers on that day. The Rescue Coordination Centre was established and supported by the Honorable Minister Benn, Minister of Public Works, Maj. Mike Charles, Captain G. Gouveia along with several agencies including, GDF, Guyana Police Force, GGMC, CDC, Ministry of Health, Guyana Forestry Commission, Air Services Ltd, CJIAC, Civil Aviation Department – Suriname, CGX and the GCAA. Information gathering and planning was done from this centre and coordinated for execution by the sub centre established at Mahdia. During the last 21 days, extensive searches were conducted by three (3)helicopters and two (2) fixed winged aircraft from a base established at Mahdia, to locations identified as high probability areas determined as a result of sightings and more than twenty interviews with miners, villagers and relatives. Over two hundred and thirty (230) hours were flown by the helicopters and fixed winged aircraft over the Blackwater Creek basin, North Fork, Konawaruk River, Ebini, Eagle, Mowasi, Glendor mountains, Kurungiku mountain range including “Toucan Face” “Twin Towers” and Toucan Valley. The helicopters conducted multiple sorties over the Blackwater Creek and North Fork areas including locations where damaged trees and crows were observed. Ground searches complemented the aerial searches after day three (3) and intensified thereafter with seven ground search parties totaling forty seven (47) persons from the Guyana Forestry Commission, St. Cuthbert’s Mission, villagers from Mahdia and Chenapau, twenty (20) Special Forces Officers, family members of Captain Persaud and volunteers. Approximately twenty insertions and extractions of ground search parties were done at nine landing areas to trek along the treacherous and densely forested terrain. Areas where potential images captured by the Canadian Twin Otter with capability of picking up large metallic objects were also combed. Later in the search, several attempts to pursue an additional lead from a camp owner were made by the Rescue Coordination Centre and the aircraft company, however, after over one week, the person failed to take officers to the location from which he said the aircraft was seen. Using this information, the GDF Special Forces Officers combed the mountainous area pinpointed, without success. Over the last weekend another team including Captain Gouveia continued the search efforts, however, once again there was no sighting of the aircraft. Over the past three weeks the search for the missing aircraft and its occupants engaged a varied and substantial number of resources, including, personnel, aircraft, specialized equipment among others and all leads have been exhausted without success. As a result the Minister of Public Works in collaboration with the RCC has taken a decision to bring the operation to an end. The Minister of Public Works and the GCAA empathize with the immediate family, relatives and friends of the missing persons, Captain Nicky Persaud and David Bisnauth in this time of distress. 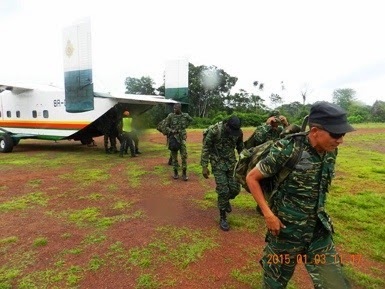 At least 30 members of Guyana’s Special Forces are Thursday expected to inserted into “an area of interest” as part of their more than one-week old search for a small plane that went missing over the country’s dense jungle and rugged terrain. The Guyana Civil Aviation Authority (GCAA) said the platoon of Guyana Defence Force (GDF) soldiers that travelled to Mahdia on Wednesday would be inserted by helicopters at sunrise barring no inclement weather. A number of areas of interest have been developed by a Canadian survey plane that is here on behalf of the Canadian oil exploration company, CGX Energy. The areas of interest have been collected from data that has been collected by the plane’s Passive Radiation Detector. The twin-engine Britten Norman Islander, bearing registration number 8R-GHE, went missing shortly before midday on December 28 while on shuttle trip with construction materials from Mahdia to Karisparu in Region 8 – Potaro—Siparuni. Aboard were Captain Nickey Persaud, 27, and Cargo Loader, 51-year old David Bisnauth. The GCAA added that six villagers from Chenapau village joined the search party at Mahdia. Over the past three days, Special Forces’ ranks, Guyana Forestry Commission officers and Line cutters have been extensively combing a large area between North Fork and Black Water rivers. If the search proves futile, additional areas will be examined, said the aviation regulatory body that is part of the Rescue Coordination Centre. I am not a pilot, not even remotely connected to the aviation industry in Guyana, however recent events have led me to question the quality of management and oversight provided to the industry by the Guyana Civil Aviation Authority. Accidents are all too common and while focus by local media is on the search and rescue teams and their progress or success, I have a few harder questions I would like to pose to those in the GCAA and the aviation industry in general. Given the nature of the Guiana Shield terrain, are our aircraft equipped with the best possible ELT’s and other systems? Are our aircraft maintenance schedules and systems subject to oversight? Are spot checks carried out? Do we have to meet just ‘minimum” standards or do we exceed these? Are pilots pressured to accept economics as part of their safety calculations? Can pilots report employers who may be applying undue pressure to complete flights in potentially unsafe conditions? Can pilots report poor maintenance procedures/systems to the GCAA? Have any reports ever been made? Are aircraft models used for ferrying cargo of fuel drums rated or designed to do so? Is shuttling fuel inherently unsafe? Given the terrain and problems experienced past and present in finding downed aircraft, would investment by the GCAA in a high quality aerial photography drone with GPS matching ability be worthwhile? Should all pilots be equipped with a satellite phone? Could we mandate reflective strips/glow in the dark stripes/even mildly radioactive paint stripes on aircraft to help with location and recovery? If any of the above suggestions seem ridiculous, please excuse them as being “out of the box” but keep in mind the thinking “inside the box” has been far from impressive. I have consulted with current and former pilots in the formulation of the above questions and many have supported the effort to ask them and look forward to official responses. While today’s search for the Britten Norman Islander that went missing shortly after takeoff last week Sunday yielded no results, hopes are high as a Canadian aircraft equipped with a magnetic reader joined the search. “We have a Canadian-registered Twin Otter doing aerial surveys and they have specialized magnetic detection equipment on board,” Annette Arjoon-Martins who is the General Manager of Air Services Limited, which owns the missing plane, told Stabroek News. She explained that the plane was in Guyana undertaking works for oil exploration company CGX and its members were approached by the Guyana Civil Aviation Authority (GCAA) asking for its services to aid in the search for Captain Nicolas Persaud, Cargo Handler David Bisnauth and the aircraft. The company agreed to give a helping hand and today began assisting in the search. “The equipment they are using will pick up magnetic stuff on the ground so that helps a great deal,” she said. Both the GCAA and ASL extended their gratitude to CGX and the Canadian crew for their services. Arjoon-Martins says that she remains optimistic that the crew will be found soon as the teams deployed on the ground are nearing the areas of interest. “The Special Forces and specialists who were on the ground yesterday and today are zoning in even tighter…we will continue tomorrow and I remain optimistic,” she posited. A 26-member group was dispatched via helicopter yesterday into an area deemed to be of high interest, bordered by the North Fork and Blackwater rivers. The area was determined based on reports of sightings in an area above the highest peak, east of Deer Creek. This area is approximately 10 miles southwest of Mahdia. The group, consisting of persons from the Guyana Forestry Commission (GFC), the Guyana Defence Force (GDF) Special Forces and line cutters from St Cuthbert’s Mission commenced their ground searches early this morning in hopes of making a discovery after days of unsuccessful searching. According to the GCAA, standard three-man teams from the GDF and GFC mapped a route to thoroughly search for the aircraft and its occupants. GCAA further said that the teams had been equipped with modern communication equipment such as handheld radios, global positioning instruments, and satellite telephones which enabled them to remain in regular contact with the Rescue Coordination sub-centre in Mahdia. Furthermore, aerial searches continued with two helicopters along with two fixed-wing aircraft. These searches were conducted not only in the area of high interest but also along the previously decided grids prepared by the Rescue Coordination Centre, Timehri Control Tower. The search continues tomorrow morning. Inclement weather remains an obstacle in the search for the Air Services Limited (ASL) Britten Norman Islander which went missing last week Sunday. Search efforts which are ongoing in the Mahdia, Region Eight territory had to be delayed until noon yesterday since bad weather curtailed the operations. The Rescue Coordination Centre is yet to locate the missing aircraft which was carrying 27-year-old Nicky Persaud and 51-year-old cargo handler David Bisnauth. The men were providing shuttle service between Mahdia and Karisparu in the Potaro-Siparuni region. They were carrying construction equipment to Karisparu and had taken off from the mining community just after noon when contact was lost with the aircraft. Today will be the ninth day since rescue efforts begun and still rescuers are no closer to locating the plane. Spirits are not too high on finding the ASL crew alive. As recent as Friday, the rescue centre deployed a further three teams to commence ground search in the Mahdia area. They were previously conducting aerial searches. The Rescue Coordination Centre is currently focusing on specific areas of ‘interest’. These are Black Water and North Fork. The centre had received at least nine reports of possible plane locations. None has however proved fruitful. Rescue works are expected to continue today depending on the weather conditions. Bad weather put a damper on recovery efforts yesterday, causing rescuers to call off the search for the missing Air Services Limited (ASL) aircraft by mid-afternoon. 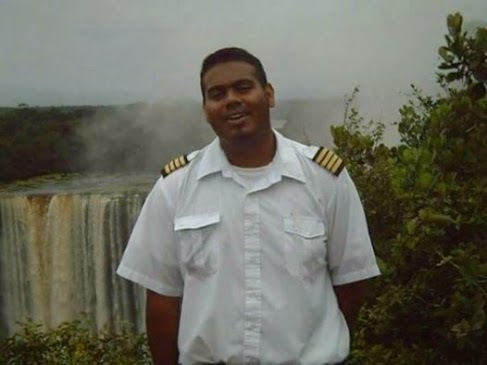 Members of the Rescue Coordination Centre (RCC) based at the Cheddi Jagan International Airport, Timehri Control Tower are yet to find the Britten Norman Islander that went missing one week ago. The ASL aircraft was conducting shuttle flights between interior communities when contact was lost just after noon. The pilot was 27-year-old Nicky Persaud and cargo loader, 51-year-old David Bisnauth, was also onboard. Hopes of finding the men alive are dwindling especially since the critical 72-hour period which is deemed pivotal for rescue efforts, expired some time ago. The RCC is determined however to continue its search efforts as long as resources permit. The body has therefore deployed three more teams into the Mahdia Potaro-Siparuni area to join the search for the Britten Norman Islander and its precious cargo. Providing an update the RCC said that 10 members from the Guyana Forestry Commission (GFC); eight ranks from the Guyana Defence Force (GDF) Special Forces and eight Line Cutters from the St. Cuthbert’s Mission were inserted by helicopter into an ‘area of high interest’ to commence ground searches bordered by the North Fork and Black Water rivers. Those two areas are along the flight path which the pilot would have taken when he left for Karisparu, -another Region Eight community – with the construction material which he was carrying at the time. The RCC has noted however, that standard ‘three man’ teams – from GFC and GDF – have mapped a route to systematically comb the mountainous terrain in search of the twin engine aircraft and the ASL crew. The teams are equipped with modern communication equipment inclusive of satellite telephones; handheld radios; global positioning instruments, and are in regular contact with the Rescue Coordination sub-Centre at Mahdia. Simultaneously, aerial examination continued with two helicopters supported by two fixed wing aircraft, not only in the ‘area of high interest’ but along the pre-determined grids which were prepared by the RCC, Timehri Control Tower. However, yesterday’s search had to be discontinued at 16:30 hours due to bad weather and will resume at first light today. The RCC said that the area of high probability was based on reports of sightings in an area above the highest peak, east of Deer Creek, approximately 10 miles, southwest of Mahdia. The RCC stated during a recent press conference that it is depending heavily on reports to carry out its operations. Minister responsible for the Transport sector, Robeson Benn told the media that all reports are being investigated. This was reiterated by the Guyana Civil Aviation Authority (GCAA)’s Director General Zulphicar Mohamed and Annette Arjoon-Martins, ASL Executive. The RCC’s search has followed them into the New Year and still there has been no sign of the missing craft. It is hoped that rescuers have better luck getting work done on the ground. January 4, 2015: A 26-member group was dispatched via helicopter into an area deemed to be of high interest that is bordered by the North Fork and Blackwater rivers. The area was determined based on reports of sightings in an area above the highest peak, east of Deer Creek. This area is approximately 10 miles southwest of Mahdia. 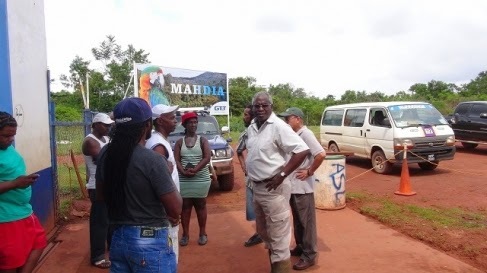 Transport Minister, Robeson Benn leading a team of officials on a fact-finding mission in Mahdia to ascertain where the Air Services Limited (ASL) aircraft may have went down. Three teams from were flown into Mahdia, Region 7 from Timehri by GDF Skyvan today to join the search for the Britten Norman Islander and the pilot and cargo handler who went missing shortly after takeoff on December 28, the Guyana Civil Aviation Authority (GCAA) said today. 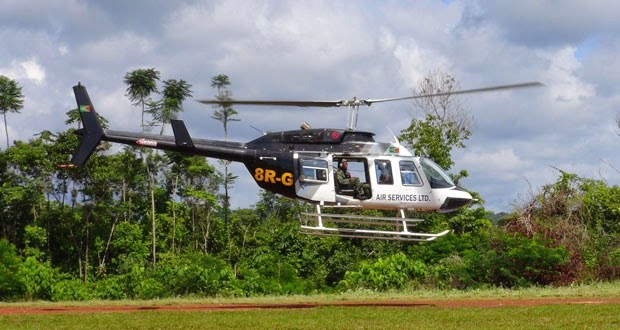 Ten members from the Guyana Forestry Commission; eight ranks from the Guyana Defence Force (GDF) Special Forces and eight Line Cutters from the St. Cuthbert’s Mission were inserted by helicopter into an ‘area of high interest’ to commence ground searches bordered by the North Fork and Blackwater rivers, the GCAA said. Standard ‘three man’ teams – from GFC and GDF – have drawn a route to systematically comb the mountainous terrain in search for the twin engine aircraft, pilot Nicky Persaud and Loader David Bisnauth, the GCAA said. The teams are outfitted with modern communication equipment inclusive of satellite telephones; handheld radios; global positioning instruments, and are in regular contact with the Rescue Coordination sub-Centre at Mahdia. The search had to be discontinued at 16:30 hrs due to bad weather and will resume at first light tomorrow, the GCAA said. The area of high probability was based on reports of sightings in an area above the highest peak, east of Deer Creek, approximately 10 miles, southwest of Mahdia. The search and rescue team looking for small plane that went missing almost one week ago has intensified its ground search in rough terrain and thick jungle, the Guyana Civil Aviation Authority (GCAA) said in a statement. "Based on information received, the RCC identified further areas of interest in the Kurungiku Mountain, Black Water area and North Fork area. A party is currently on the ground conducting a search of the Black Water area after completing a similar exercise in the North Fork area. In addition, a more intense ground search effort will commence tomorrow (Saturday). Other specialist teams have been mobilized and will be transported to Mahdia and other areas of interest. The teams are drawn from personnel of the Guyana Forestry Commission, Guyana Geology and Mines Commission and Air Services Ltd," the regulatory agency added. Minister of Transport, Robeson Benn and the Guyana Civil Aviation Authority’s Director General, Mr. Zulficar Mohamed, and members of the Rescue Coordination Center (RCC) travelled to the RCC’s sub-center in Mahdia yesterday, January 1, 2015 to assist in the Search and Rescue mission for the ASL’s aircraft which went missing on December 28, 2014. The aerial Search and Rescue operations based at Mahdia continued today; however, due to inclement weather and overcast conditions, the operations started late. Further, more than 150 square miles were covered in the Search and Rescue effort; and in excess of 60 hours of flight time were logged in the Search and Rescue mission for ASL’s Britten Norman Islander aircraft, bearing registration 8R-GE which went missing on Sunday 28th, December, 2014. Facebook group Guyanese Pilots has been speculating on the causes for the disappearance/crash of flight out of Madhia on Sunday and what can be done to prevent such accidents. Milo Willi posts a screenshot of the typical route needed to fly to the mining strip showing that it has to divert around mountains. “So it’s quite possible Milo Because of de bad weather, he was blown off course or became disorientated ,and flew into de mountain…” writes Beni Sankar. “So many possibilities Beni..I suspect CFIT, Engine failure or a combination of both” replies Willi (CFIT stands for Controlled Flight into Terrain). Shuttling and the safety issues were also raised given that four flights have crashed with the loss of 11 lives ferrying supplies to mine sites. Overloading and the proper strapping of fuel barrels was also discussed as following the crash in January the suggestion was the pilot and the loader may have survived if the supplies had not come crashing down on them when they landed. Shuttling is inherently dangerous as it requires a lot of short trips which means many takeoffs and landings which are always the most dangerous parts of any flight. However it is very lucrative to the pilots and the aircraft operators. 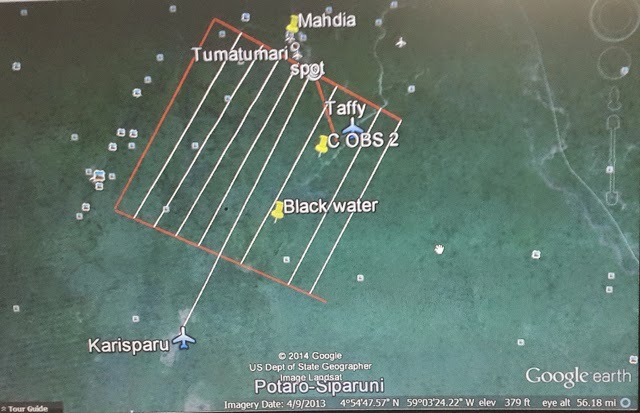 Aviation officials have dispatched a search party to an area just outside Mahdia in the Potaro-Siparuni Region Eight area, following the disappearance of an Air Services Limited (ASL) aircraft which lost contact with authorities shortly after taking off for Karisparu, also in the Potaro-Siparuni region. The Britten-Norman BN-2A-6 Islander (8R-GHE) said to be carrying the pilot Nicky Persaud, 27 and cargo-handler David Bisnauth 51, lost tower connection about 10 minutes after leaving the take off point. They were said to be carrying mining supplies. Captain Persaud and Bisnauth, 51, were onboard the twin-engine aircraft which took off from Mahdia at 11:42hours on a routine local cargo flight. The aircraft was scheduled to arrive at Karisparu at 12:00hours. At 16:20hours, Timehri Air Traffic Control made contact with the aircraft operator to establish whether the aircraft landed before implementing a search and rescue operation. However, no information was received, the aviation authorities said, and the Air Traffic Control commenced the ‘alert phase’ and the Rescue Coordination Center at the Timehri Control Tower was activated. It was stated that two Air Services Ltd. (ASL) Cessna 208 Caravan flying within the area were vectored to commence the search for the aircraft. A Piper Cherokee from Hinterland Aviation and an ASL Bell Helicopter also joined the search. Additionally, an ASL Caravan departed for Mahdia at 16:16hours with a GDF Special Forces Unit to assist in the search and rescue operation. The search continued until sunset and the two helicopters and Cessna Caravan are at Mahdia waiting to recommence the exercise at sunrise today. Other aircraft from ASL will also depart early this morning to join the forces and take in the GCAA Coordinators and Investigation team. The GDF helicopter is also on standby. A six hour and 40 minutes search time was logged by four fixed wing aircraft and the two helicopters that participated in the search. ASL’s General Manager Annette Arjoon-Martins told Kaieteur News yesterday that the Company is vigorously pursuing search efforts along with other aviation bodies. She said that ASL immediately dispatched company carriers in search of the missing plane. About half an hour later she said, the company’s helicopters were also dispatched, while the country’s military was placed on standby. While it is still unclear what would have happened to the twin engine carrier and its occupants, officials have speculated that current weather conditions may not be the best suited for flying in that part of the Region. After a more than six hour search for a missing plane, with two persons aboard, a search and rescue mission came up empty-handed and called off their operation at sunset Sunday until day-break Monday, the Guyana Civil Aviation Authority (GCAA) said in a statement. The GCAA said the Britten-Norman BN-2A-6 Islander, bearing registration number 8R-GHE, went missing while on a flight between Mahdia and Karisparu in Region 8 (Potaro/Siparuni). Aboard the twin-engine aircraft were Pilot Nickey Persaud, 27, and cargo loader, 51-year old David Bisnauth. The Authority said that six aircraft, including two helicopters, carried out a six hours, 40-minute search over the area but there was no sighting of the plane. “The search continued until sunset and the two helicopters and one Cessna Caravan are at Mahdia and will recommence search at sunrise tomorrow (December 28, 2014). Other aircraft from ASL will depart early tomorrow (Monday) morning to join the search efforts and take in the GCAA Coordinators and Investigation team. The GDF helicopter is also on standby to join the search and rescue operation. To date, 6 hours and 40 minutes search time was logged by four fixed wing aircraft and two helicopters,” said the GCAA. According to the authority, the Timehri Air Traffic Control lost communication around noon today, December 28 with the plane. Facts are: The Britten-Norman BN-2A-6 Islander took off from Mahdia at 15:42 UTC (11:42 local time) on a routine local cargo flight and the last known position was Spot Tracker hit at 15:44 UTC (11:44 local time). The aircraft was estimated to arrive Karisparu at 16:00 UTC (12:00 local time). At 16:20, Timehri Air Traffic Control made contact with the aircraft operator to establish whether the aircraft landed before implementing a search and rescue operation. After no information was received, the Air Traffic Control commenced the ‘alert phase’ and the Rescue Coordination Center at the Timehri Control Tower was activated. In the meantime, two Air Services Ltd. (ASL) Cessna 208 Caravan flying within the area were vectored to commence search for the aircraft. A Piper Cherokee from Hinterland Aviation also joined the search efforts. An ASL Bell Helicopter also departed Ogle Airport to join the search for the aircraft. Additionally, an ASL Caravan departed for Mahdia at 16:16 local time with a GDF Special Forces Unit to assist in the search and rescue operation. GEORGETOWN, Guyana (AP) — Authorities in Guyana are searching for a small cargo plane that vanished with two people aboard while flying over remote jungles in the South American country. Guyana's civil aviation department says the Britten-Norman Islander aircraft went missing on Sunday. The two men on board — a pilot and the cargo plane's loader — both were identified as Guyanese. They had been delivering fuel and other cargo for mining camps in southwestern Guyana. Rescuers had yet to find any sign of a fire or wreckage. Earlier this year, another small plane disappeared while bringing supplies to miners in the country's dense western jungles. PENN TOWNSHIP, Pennsylvania -- State police are investigating after four (4) men criminally trespassed at the Federal Aviation Administration air traffic navigation tower in Penn Township, Snyder County, early Sunday morning. The FAA’s intruder alarm alerted officials to the break in around 1:30 a.m. When troopers responded, they located the men insider the tower. Due to this break-in, police said that air traffic directional range malfunctioned and caused a loss of aviation radar. The men’s names have not been released. FAYETTEVILLE, W.Va. (AP) - BASE jumpers, rappellers and vendors participating in future Bridge Day events will have to undergo fingerprint scans. Bridge Day Commission chair Sharon Cruikshank says that the scans are less intrusive than routine background checks. Fingerprints will be checked against a terrorism watch list. They won't be saved. So far, reaction to the decision has been mixed. Cruikshank says rappellers and vendors don't have any issues, but some in the BASE jumping community aren't happy. BASE jumpers from around the world flock to the New River Gorge Bridge on the third Saturday of every October for Bridge Day. BASE stands for building, antenna, span and Earth, the fixed objects from which jumpers leap. Bridge Day organizers began requiring background checks after the Sept. 11 terrorist attacks. A word of warning for those short-tempered souls battling long airport security lines on their way back from holiday travel: Your fellow passengers are just as stressed and more likely this year to be armed to the teeth. The federal Transportation Security Administration caught more people in 2014 trying to slip firearms, knives, grenades and even swords through security screening checkpoints than in any year in the past decade, according to agency statistics. As of Dec. 25, TSA agents had retrieved 2,164 guns from carry-ons, purses, and coat pockets - a nearly 20-percent increase over last year. In fact, the number of weapons agents have seized has increased every year since 2007. That steady rise has security officials perplexed. For all the attention and controversy heightened airport security measures have received since Sept. 11, 2001, who still thinks they won't get caught packing heat in their carry-ons? Last month, at the start of the holiday travel season, the agency launched a media campaign at airports to remind people to check their guns or leave them at home. Those caught trying to slip a weapon through a checkpoint can face fines of up to $11,000 and possible criminal charges. Not to mention the wrath of everyone else waiting in line: "Every time TSA discovers a firearm in a bag at the checkpoint, it delays the screening process for all travelers," said Ross Feinstein, an agency spokesman. But don't breathe easy just yet. What local passengers lack in sheer size of their airport arsenals, they more than make up for in ingenuity. In October, X-ray scans at Philadelphia International Airport revealed one passenger packing a knife in a neck pillow - a move rivaled only by the traveler found a month later with a blade hidden in the heel of his shoe. Another passenger was stopped in May with a hollowed-out textbook hiding 70 pills. And just last week, Philadelphia airport screeners encountered a man with hidden knives - hidden, that is, inside a pen and a highlighter clipped into his shirt pocket. That latest discovery appeared in the confidence-instilling blog post titled, "37 Loaded Firearms, Five Inert Grenades, Black Powder Pellets & More," detailing TSA's Christmas-week nationwide haul. TSA officials say most travelers caught with firearms claim they simply forgot the gun in their bag. That was the explanation NBA Hall of Famer Bill Russell offered when agents in Seattle found a loaded .38-caliber Smith & Wesson pistol in the Boston Celtics legend's carry-on last year. Russell later apologized and still made his flight. Kathryn Spiropoulos, a 53-year-old school administrator from Ewing, N.J., wasn't so lucky. She found herself in handcuffs after TSA agents in Philadelphia detected an unlicensed and loaded Glock .45-caliber handgun tucked in her purse - next to a credit card-shaped knife. So much for flying the friendly skies. A new jet charter business, London Private Jet, has opened in the city, offering business a local option to avoid crowded airports and inconvenient schedules. Jackie Charabin, managing partner in ADJ Holdings Ltd., which operates the service, opened the jet-leasing business with her sister, Diana House, in September. They’ve had about four rentals a month, mostly out of Toronto and Hamilton, at a cost of $4,000 an hour, Charabin said. It’s not a bad start, but she hopes to build the brand. “We saw an opportunity here in London and we decided to give it a try,” she said. The business is owned by Andrew Charabin, owner of ADJ Holdings Ltd. and father to the sisters. He owned and operated Advanced Manufacturing Technologies until he sold it in 2012 to a large U.S.-based firm. After selling, Andrew bought into an air cargo business in Hamilton and is now in talks to sell it. However, he’s keeping a five-passenger Gulfstream G100 jet that was part of the cargo business. Enter the sisters trying their hand at a charter service. The plane is maintained and housed in Hamilton, but the business is operated out of London. Charabin is shooting for about 20 hours of charter business monthly to make the business viable. “The margins are not huge, but there is good value in the service we offer,” she said. The business could be in for a bumpy flight, suggests Graham Casson, chair of the aviation program at Fanshawe College, who also owned a jet-leasing business. Only now have aircraft sales reached 2008 levels and business jet manufacturers have seen sales drop by half, with some players declaring bankruptcy and taken over by larger ones, he added. But Mike Seabrook, chief executive of London International Airport, said he sees private charter jets on his tarmac daily and wonders why a London company can’t get a piece of that action. A controversial magazine which supports the Al-Qaeda organization has called on terrorists to target easyJet planes. The latest edition of the Inspire magazine carries a feature on Lone Wolf terrorists urging them to attack British Airways and easyJet flights. Bristol Airport is a major center for easyJet and the airline, which has its headquarters in Gatwick. The airline flies to 40 destinations from Bristol and, as reported in the Bristol Post, is looking to add more routes. Also in the firing line are Air France and American Airlines, United, Continental and Delta - alongside high-profile US figures including Bill Gates. The magazine praises Umar Farouk Abdulmutallab who was jailed for life after he attempted to bomb a flight from Amsterdam to Detroit. The latest edition of the magazine includes instructions for would-be suicide bombers who want to bypass airport security. Its author - dubbed the 'Al-Qaeda chef' - was re-interviewed this week as the magazine claimed the attacks were a 'natural reaction' to the 'arrogance' of the U.S. The Culpeper AirFest won a prestigious award recently. The annual Culpeper Airshow was awarded the Silver Pinnacle Award for small civilian air shows for the ground-breaking “Potomac Flight” over Washington D.C. in honor of the Disabled American Veterans Dec. 10 at the International Council of Air Shows annual convention in Las Vegas, Nevada. “Potomac Flight “launched on Sunday, Oct. 12, where approximately 24 T-6 Texans departed Culpeper Regional Airport (in Culpeper, Virginia) for a unique flyover of Washington D.C.’s greatest landmarks including the Pentagon and Arlington National Cemetery. The flyover in the skies over the Pentagon and Arlington National Cemetery was in honor of DAV as a visible and fitting tribute to the services and sacrifices veterans have made for our freedom. “The award is a source of great pride to our Culpeper Air Fest. We were thrilled to be able to execute the Potomac Flight this year and couldn’t be more proud of the much needed attention it drew for veterans’ needs,” said Mike Dale, Culpeper Air Fest Chairman. The Culpeper Air Fest is produced by the Culpeper Airport Commission and funded by the Culpeper Air Fest Foundation - a 501c(3) non-profit charitable organization chartered to promote aviation education, awareness and support in Culpeper. Visit CulpeperAirFest.com. Police say a man was stabbed during an argument in the parking lot of a restaurant in the New Castle area. State police say the stabbing occurred around 2:30 a.m. Sunday outside the 1 in Town African Restaurant on DuPont Parkway near the New Castle Airport. Police say the 36-year-old victim had just left the restaurant and was arguing with some other patrons in the parking lot when someone pulled a knife and stabbed the man. Police say the victim was taken to a hospital by private vehicle, and his condition is stable. Police have not identified any suspects.